… and now we’re back to give you a First Look at the brand new Ample Hills Creamery on Disney’s Boardwalk! 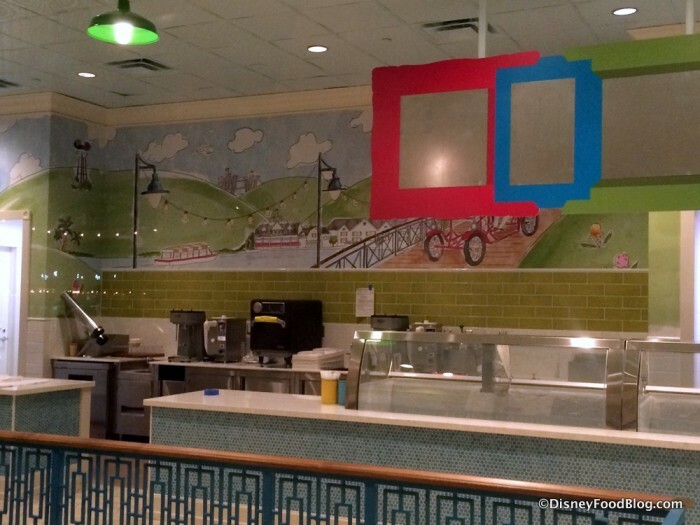 Just a few days ago, the walls came down around the newest ice cream parlor in Disney World and we were able to steal a glimpse of the spot located right next door to the ESPN Club. But now Ample Hills Creamery is currently in soft openings, and we were able to pop in for what we’ve all been waiting for… ICE CREAM!! 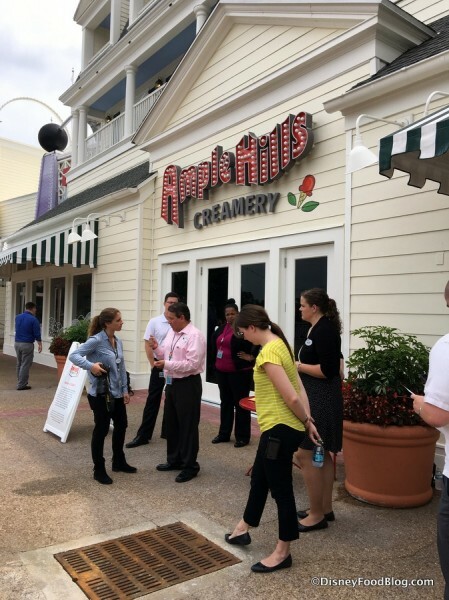 First, though, just a note that soft openings are like a “dress rehearsal” for new eateries and attractions around Disney World. 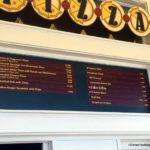 This means that there are no guarantees that the spot will be operating at any given time, and — in the case of restaurants — the menu may not be finalized, or certain ingredients may not be available until everything is official. 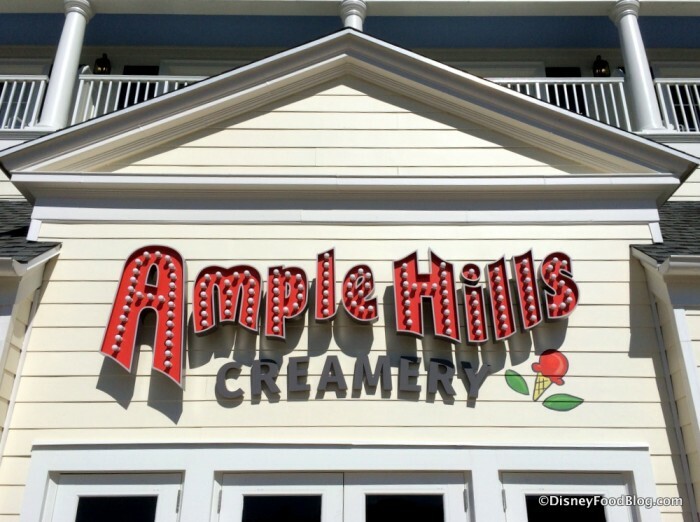 In the case of Ample Hills Creamery, the anticipated official opening will take place on May 15th. 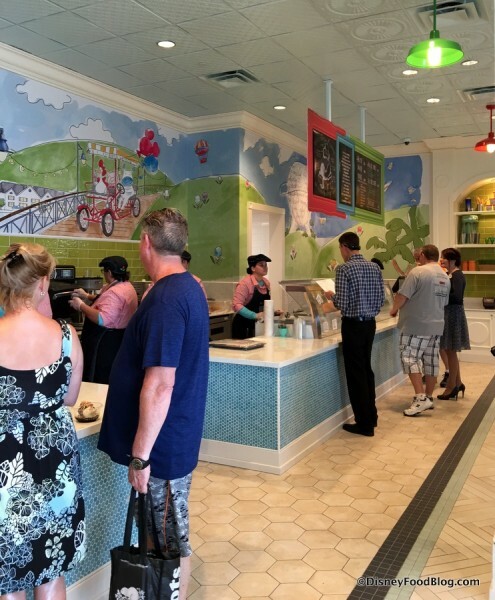 But we just couldn’t wait any longer to get a taste for ourselves so we could bring it to YOU… so welcome to the first Ample Hills Creamery location outside of New York State, right here in Disney World! 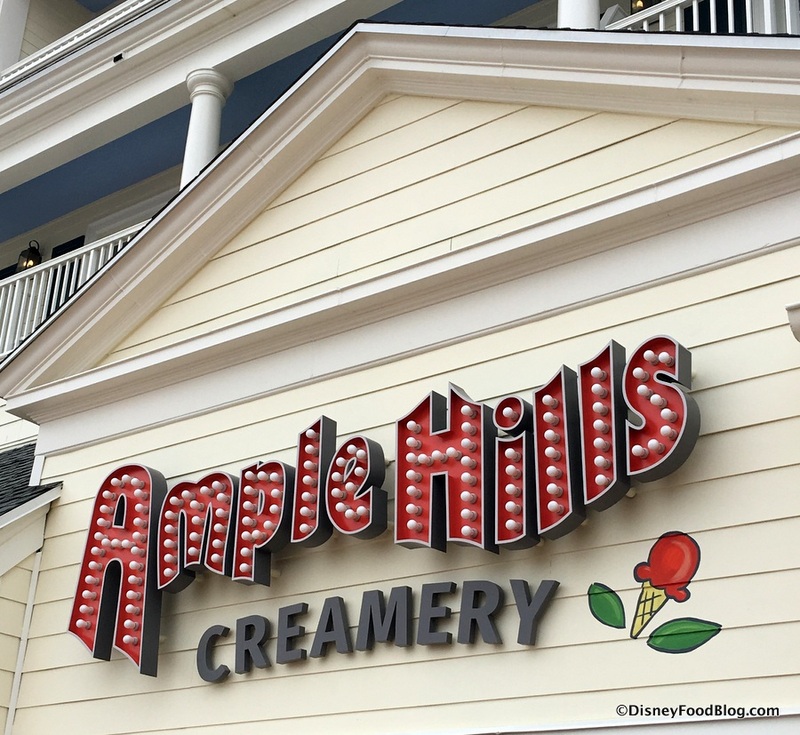 The first thing you see as you approach Ample Hills Creamery is the company’s logo on a sign enhanced by those signature Boardwalk lights. Step inside, and it’s straight into the queue where you can look up to check out the menu (there’s a closeup on that to come!) and start the process of narrowing down your choices. 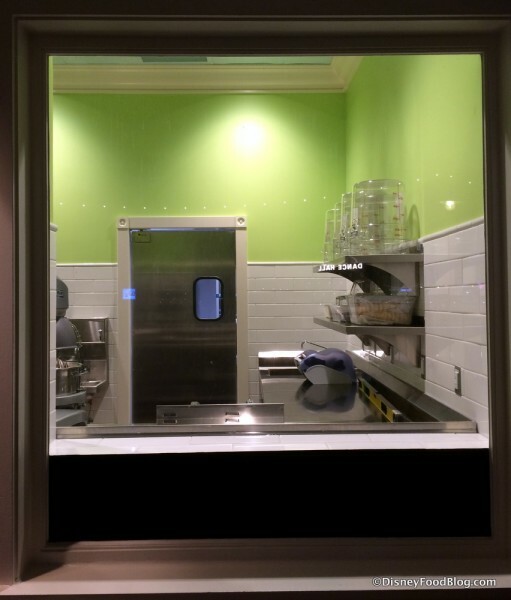 And, of course, you can take a closer look at the available flavors in the ice cream case… but more on that soon 😉 . Meanwhile, passersby strolling the Boardwalk are also able to peek in the window and scope out the scene for themselves. Back inside, several elements come together on the artwork lining portions of the walls: one primary setting is Disney’s BoardWalk, with its Friendship Boats, surrey bikes, and wooden paths — among other Boardwalk hallmarks — all recognized in the mural. Oh, and a certain Castle is not too terribly far away, either 😉 . The Brooklyn Bridge in the distance of the painting pays homage to New York City, the original home of Ample Hills Creamery. 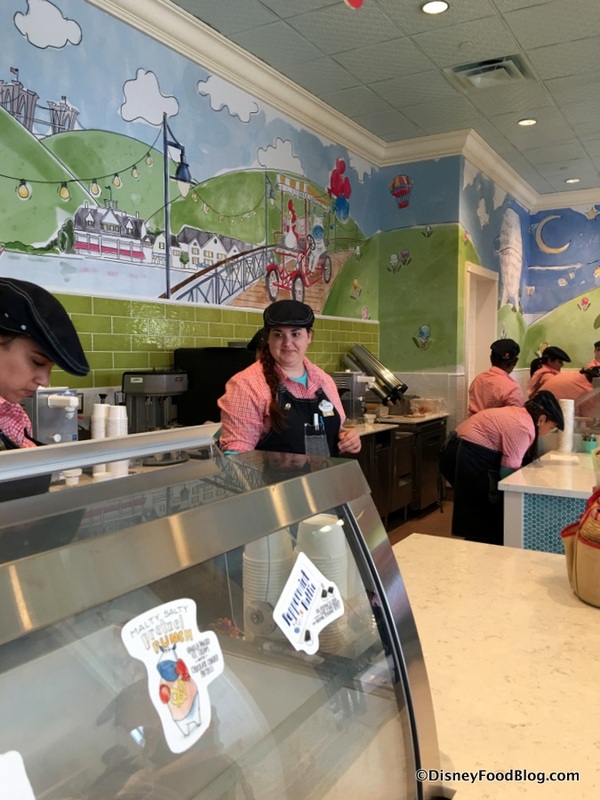 The overall feel is bright, airy, and whimsical, with special touches specific to Ample Hills providing opportunities to get to know some new friends. Meet Whitty, PB, and Walt (See? 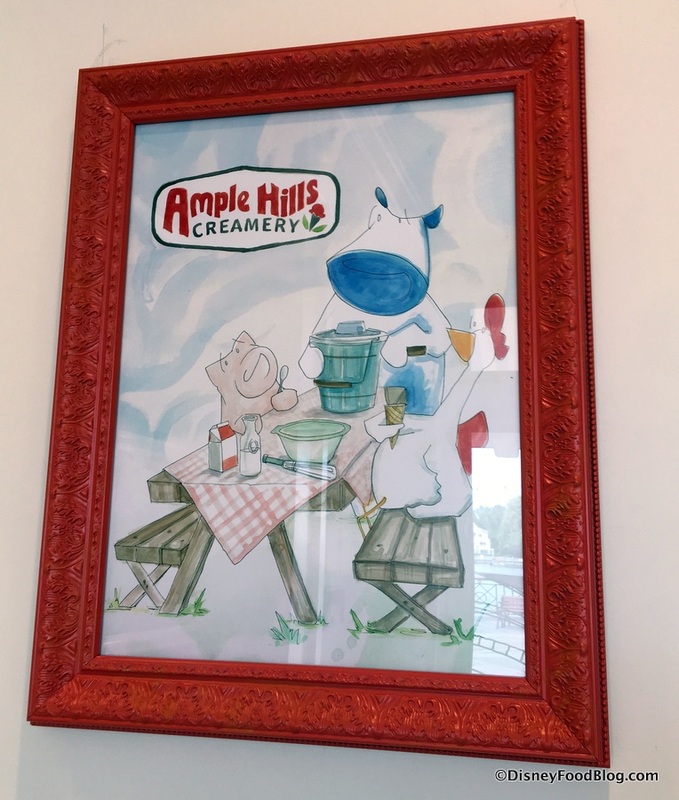 Disney and Ample Hills is a combo that was meant to be 😉 ). 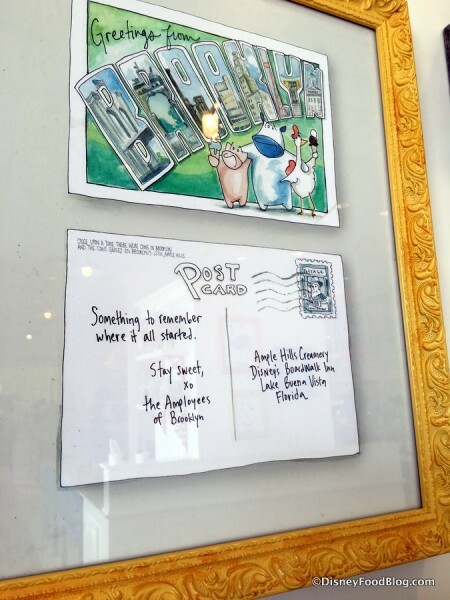 This is a fun postcard from the “Amployees” in Brooklyn to those just starting out here in Florida! 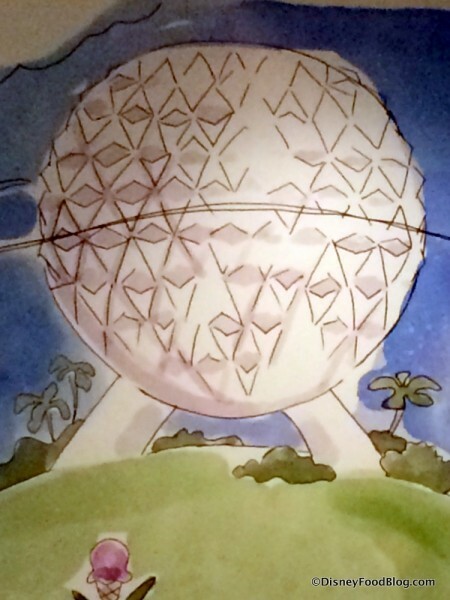 Even more decorations celebrate the house specialty. 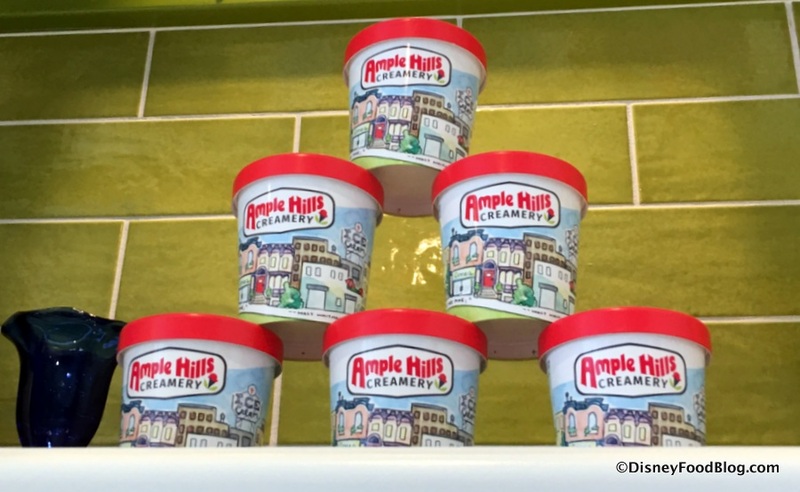 And don’t forget that you can buy pints and have them shipped to you via the Ample Hills website. But we’re HERE, and we’re hungry, so let’s get going! 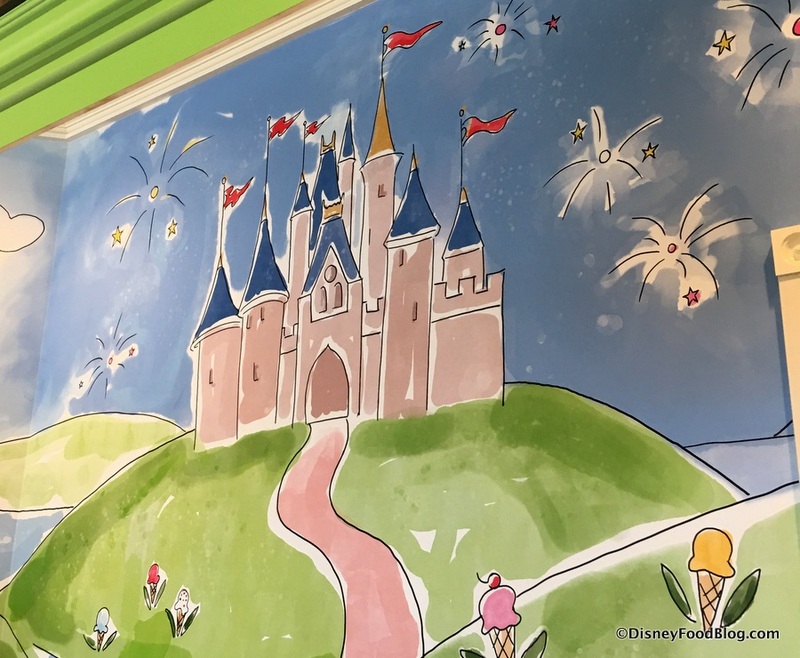 You can grab your ice cream in a small or large Cup or Cone (Disney Dining Plan participants should note that a Small Cone or Cup is eligible as a snack credit). You may also choose a Sundae or Milkshake. We’d hoped the Boardwalk location might feature the famous Ice Cream Flights, but while they’re not serving them now, they hope to in the future! Even your options have options 😉 . 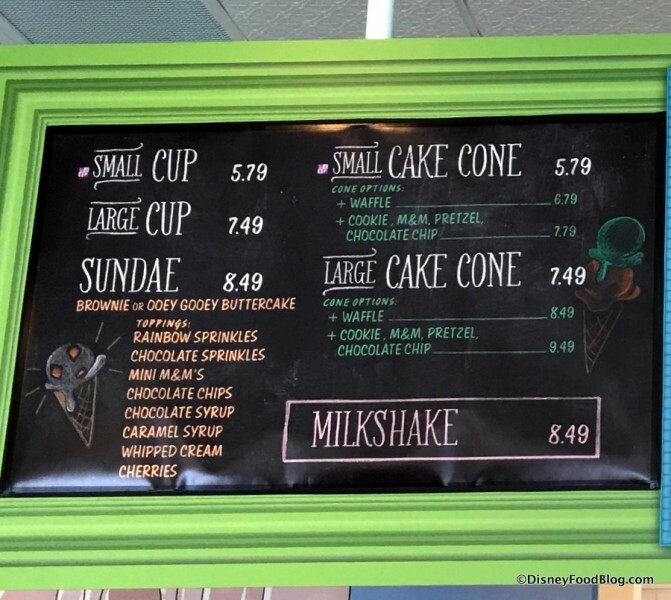 Cone choices include Waffle, Cookie, M&Ms, Chocolate Chip, Pretzel, and Cake Cones. 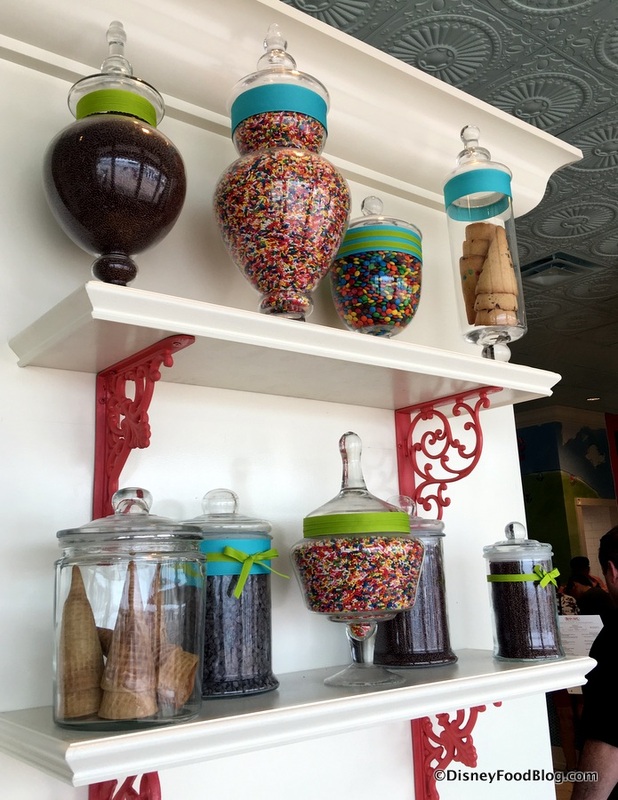 Sundaes are also highly customizable with either a Brownie or Ooey Gooey Buttercake base. Top it with items like Chocolate Sprinkles, Chocolate Chips, Rainbow Sprinkles, Mini M&Ms, Chocolate Syrup, or Caramel Syrup. And just take a look at these FLAVORS!!!! 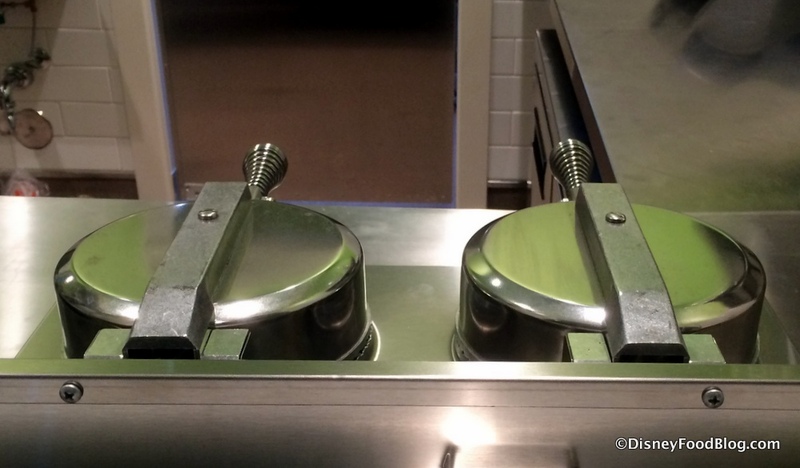 … to Malty Salty Pretzel Punch and Vanilla Bean. 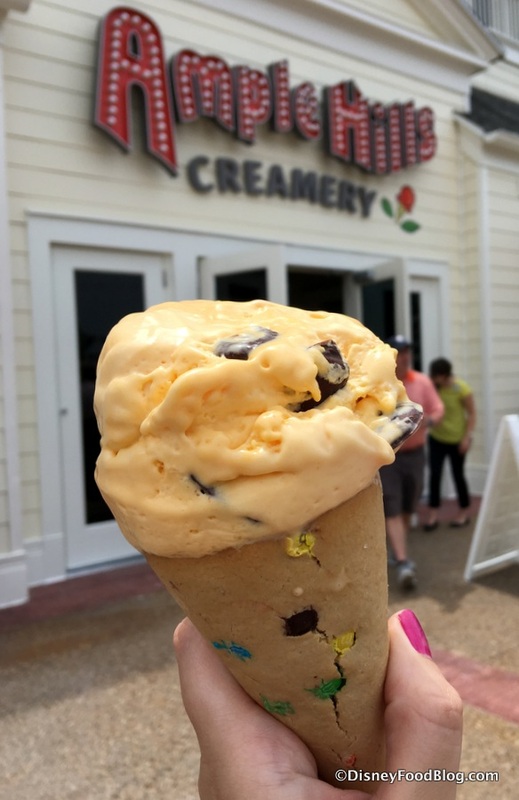 It’s a mix of the anticipated unique and fun flavors from Ample Hills, as well as classics that still have a bit of a twist (for instance, Vanilla Bean is made with Madagascar Bourbon Vanilla Beans). PB Wins the Cup features house made Peanut Butter Cups, while Baked/Unbaked has pieces of Housemade Chocolate Chip Cookies AND Brown Butter Cookie Dough in the mix! Like caffeine with your ice cream? Check out the Coffee Toffee Coffee made with espresso-infused chocolate-covered toffee bits (house-made, of course!). 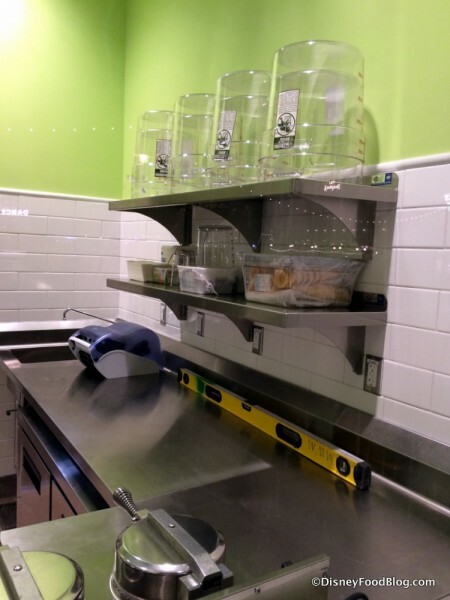 The Sweet Cream & Cookies includes pieces of Back-to-Nature Sandwich Cream Cookies. Strawberries & Cream is “smooth and pure strawberry ice cream,” while Chocolate Milk & Cookies brings together the flavors of that good ol’ snack combo from childhood. And the choices keep coming (so it’s a VERY good thing that you can ask for samples)! 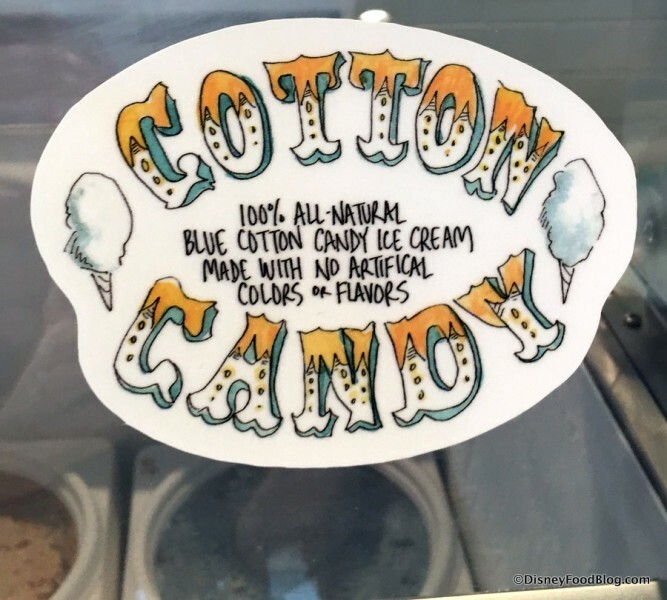 Butter Pecan Brittle, Cotton Candy (perfect for the Boardwalk!) and Nonna D’s Oatmeal Lace continue to round out the options. 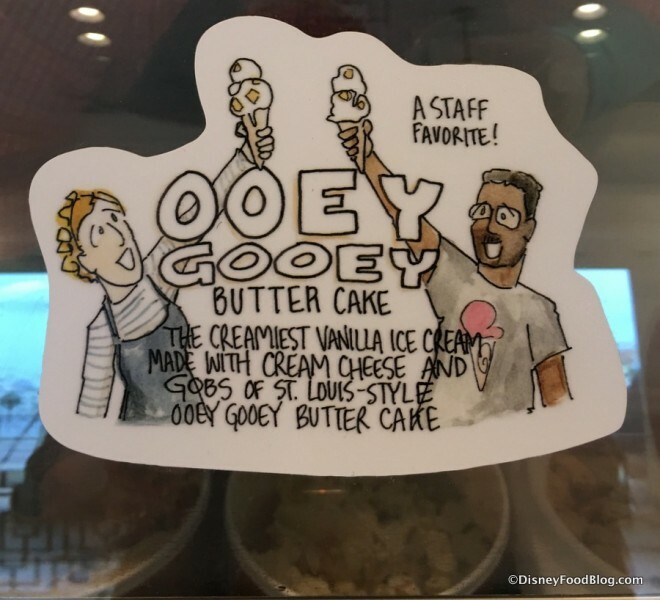 And they haven’t forgotten the highly anticipated Ooey Gooey Butter Cake “made with gobs of St. Louis-style Ooey Gooey Butter Cake”! 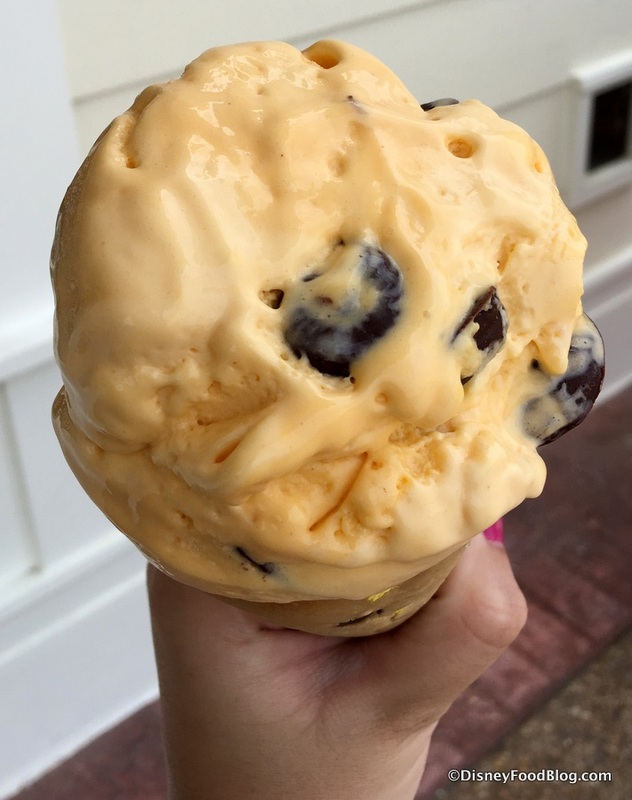 As promised, there is even a one-of-a-kind flavor made exclusively for Disney World! And here it is… Sally Sells Seashells in honor of Ample Hill’s new Boardwalk home 🙂 . It’s pictured above with Lemon Sky, a Lemon Ginger Sorbet (Ooh… that one’s made with a splash of Limoncello!). 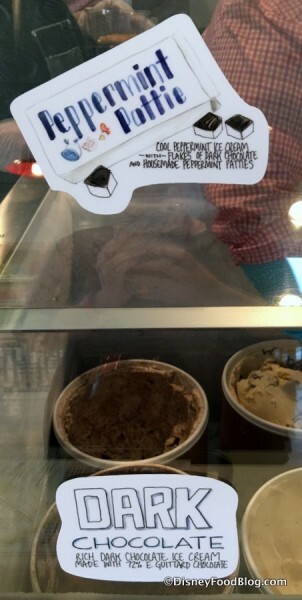 Now how could we possible resist a flavor exclusive to our favorite place? Here’s our first taste of Sally Sells Seashells in an M&M cone! The ice cream was, as you can tell from the photo, a little soft, but we’re told that’s not to be the norm in the future. They’re still working on freezer temps in these opening days. Plus, you know… FLORIDA 😉 . 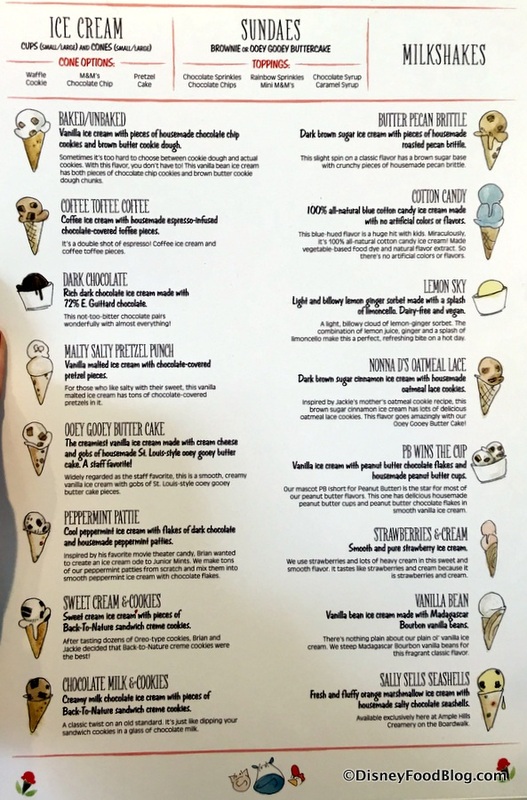 But the sweet, orange ice cream was complete with actual little bits of orange interspersed throughout the ice cream lending a wonderfully fresh taste to the whole thing. And the housemade chocolate seashells — which offered terrific bursts of saltiness — were to die for! This unexpected flavor combo ultimately ended up as my favorite! 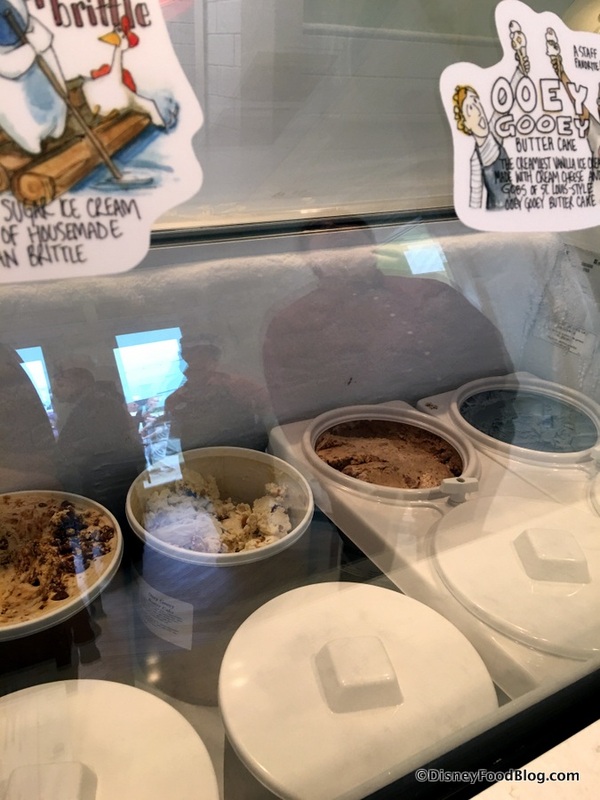 But that doesn’t mean the others were slouches, either… here’s a cup of Baked/Unbaked alongside a scoop of PB Wins the Cup. 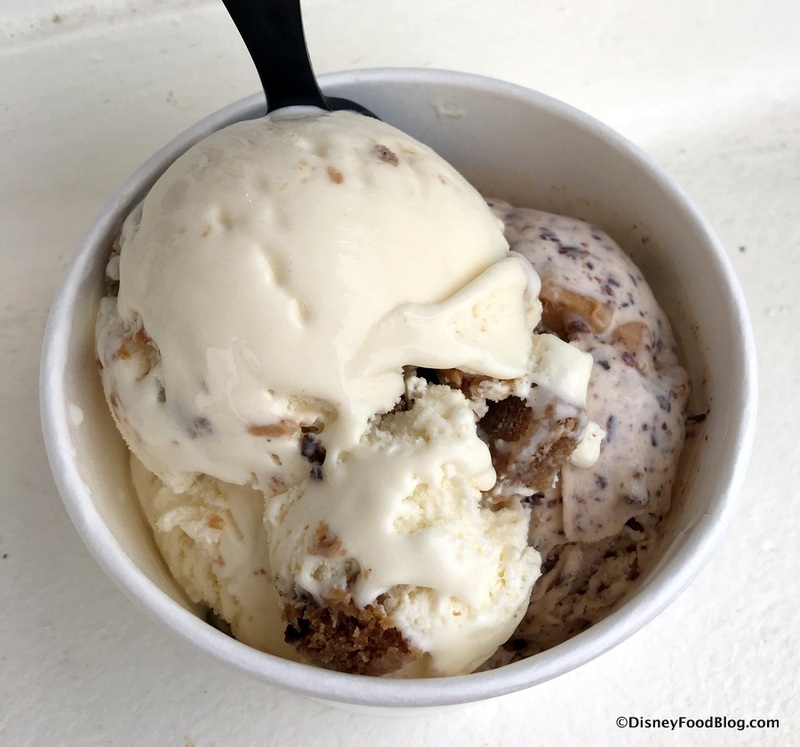 Baked/Unbaked (the top scoop) is vanilla ice cream with pieces of house made chocolate chip cookies and brown butter cookie dough. It’s incredibly sweet, and entirely decadent. 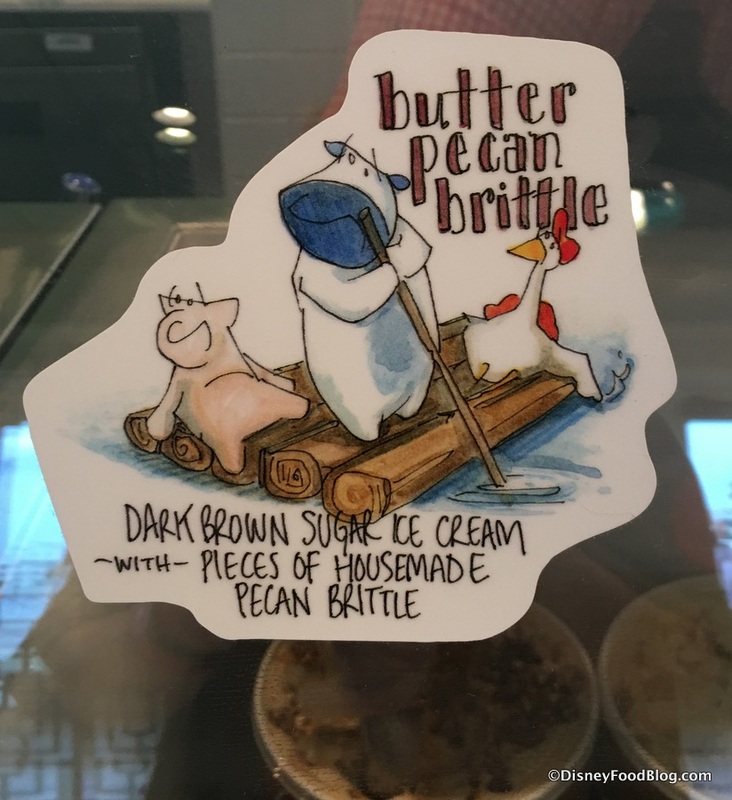 PB Wins the Cup is a vanilla ice cream base full of peanut butter chocolate flakes and house made peanut butter cups. The peanut butter is VERY prominent, so you PB fans out there (like me!) will go crazy for it! Don’t miss it, Peanut Butter lovers! 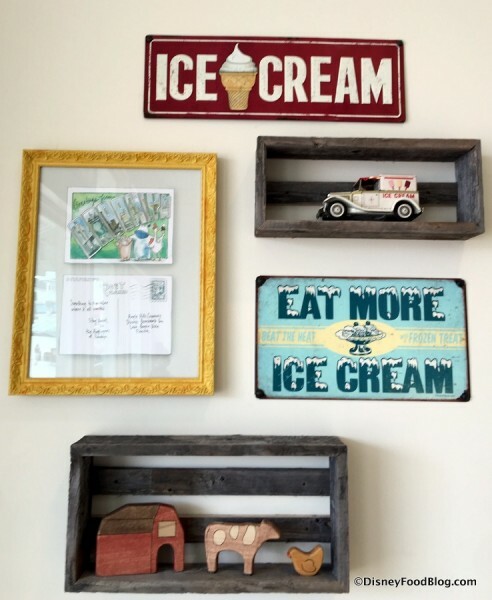 In fact, that goes for all my fellow ice cream fans (and who doesn’t love ice cream? )… Do NOT miss Ample Hills Creamery. 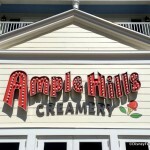 I am SO happy to say that our first tastes of Ample Hills Creamery ice cream totally lived up to the hype! 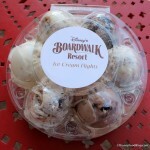 Rich and fresh ice cream with unique and fun flavors… it fits right in with some good old fashioned Boardwalk FUN! Remember: the official opening of this spot won’t happen until this coming Sunday, May 15th. 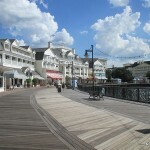 But if you happen to see those doors open during a Boardwalk stroll over the next few days, do yourself a flavor (ha!) and stop on in! And please do let us know what you think! 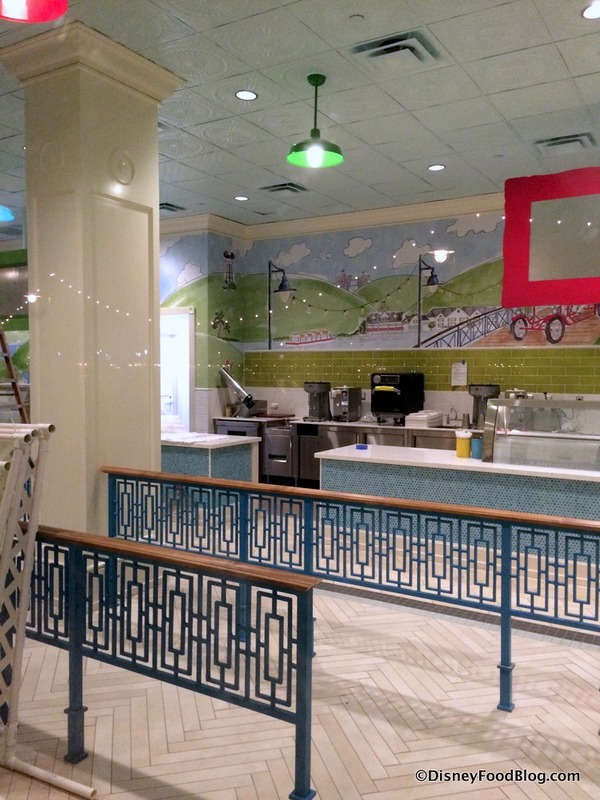 Which flavor would you most like to try at the new Ample Hills Creamery? Please let us know with a comment! Darn! 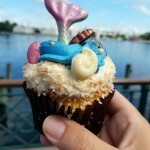 I was hoping they would carry the new Star Wars flavors… do they take requests for flavors we would like to see? I cannot wait to try the cookie cone! 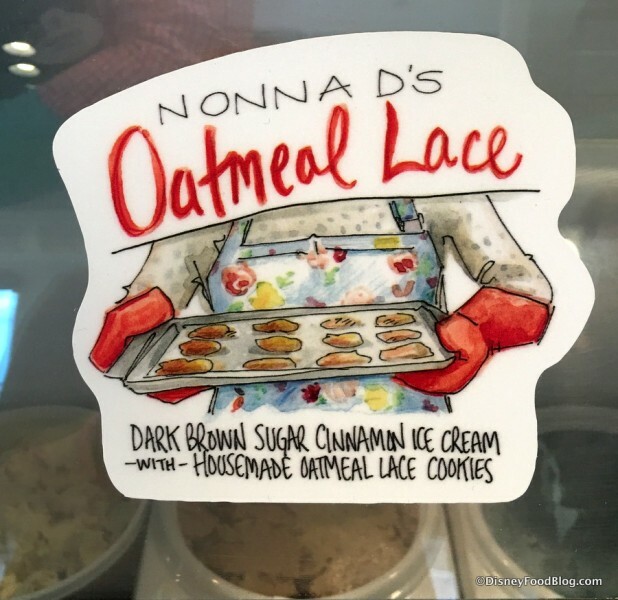 As far as flavors go… that’s a hard choice! The baked/unbaked looks good and so does the ooey gooey butter cake! I get to taste soon (next month)! Ooey, Gooey sounds good, but so does the Crispy Treat and the Salty Pretzel Punch, and the Pecan Brittle, too! I’d even be quite happy with just munching on an M&M cookie cone! Gonna check it out next week! 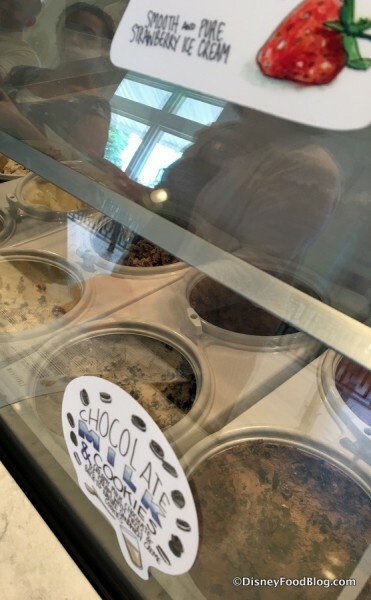 Scored a soft opening free treat on Wednesday. To me ice cream is usually ice cream, but this was really good. My wife and i had different sundaes. Her’s w Peppermint Pattie, mine w PB Wins the Cup. Both were terrific. I have to admit though, it isn’t cheap!! It may be a tad expensive for some people, but, it isn’t going to be something you do every day and to be honest if what I got yesterday is anything to go by then it is worth it in my books. Oh wow! Lemon Sky is labeled as vegan! Can’t wait to try it! Everything looks delicious but soo expensive!! For the price of $8.49 for a sundae, can you get all of the toppings listed? Honestly, after getting in for the soft opening this week, it’s worth it. 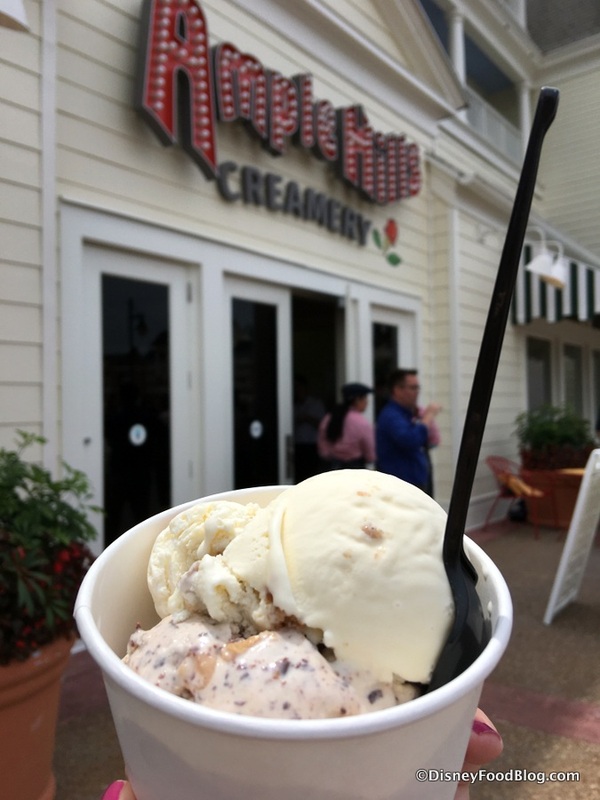 Budget to have it as a treat on your next trip & you won’t be disappointed — the quality of ingredients and the house-made toppings make a huge difference. Quality food isn’t cheap no matter where you are, but it’s worth it! I’d get the dark chocolate in a pretzel cone! Love the salty-sweet combo! Yes a tad pricey, but looks like far nicer stuff than the pre-packaged ice cream carts in the parks. Looks unique and pretty good, but does seem pricey. I know it’s more than they charge at NYC locations. Those two ice creams cost you nearly $20 I assume? My wife and I had the chance to stop in during their soft-opening hours this past Saturday. 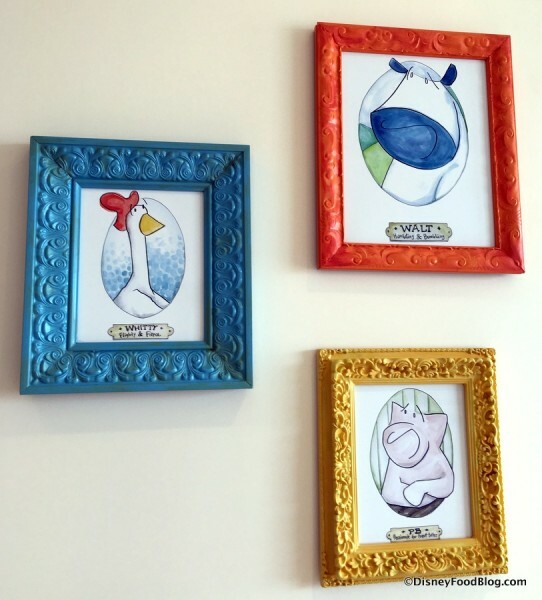 We each had a small cup – cotton candy in one and sally sells seashells in the other. Both flavors were enjoyable, though the cotton candy did not have in our opinion much of what we feel is a cotton candy flavor. Each ice cream to my palate was quite rich and very creamy. I am betting the butterfat content of the cream used is quite high. For me, this makes for an enjoyable ice cream in smaller portions. The best analogy I can think of is using heavy cream in your morning coffee rather than half and half. 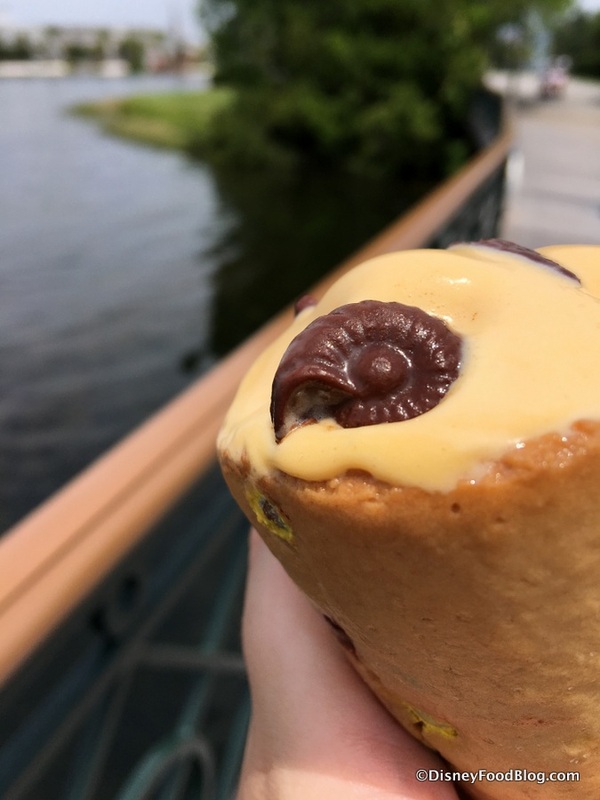 Because of this, L’Artisan des Glaces in EPCOT is an easier to eat ice cream as you can eat a cone and not feel weighed down by the heaviness of the butterfat. All in all though a solid entry and a welcome addition to the Boardwalk area. Just a note – Sally Sells Seashells is NOT vegetarian, as it is made with actual marshmallows. I asked the cast members there and they were very knowledgeable about it, as they make it/see it being made. How many scoops/flavors is the small cup?